Once Upon a Twilight! : Revenge of the Fifth Giveaway: #The5thWave Battlefield! 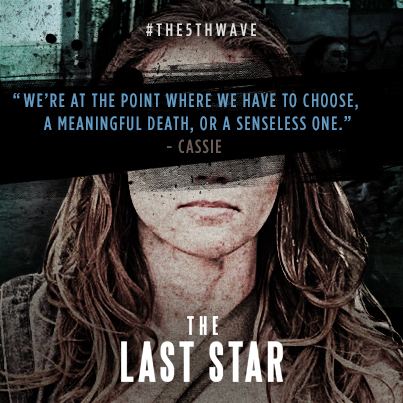 Revenge of the Fifth Giveaway: #The5thWave Battlefield! May is one of my favorite months! With two Star Wars references, Robert Pattinson birthday and now, the release month of The Last Star by Rick Yancey... who wouldn't want to celebrate? WHO IS IT? TELL ME NOW, RICK!! It better not be Cassie, because I will become a battlefield. Okay, I'll calm down and wait for the conclusion of The 5th Wave series. 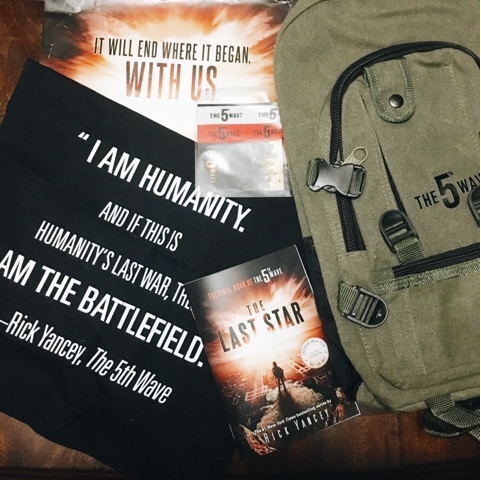 To continue with this post, I want to let you all know PenguinTeen provided us a cool 5th Wave tote bag along with The Last Star sampler and poster! In addition, Sony Pictures Entertainment sent over a very exclusive 5th Wave backpack and hand band.... and we are giving these items to one lucky fan of the series! Tell us what you expect to happen? Or what you are dying to know? You will have other options, but you will need to tell us your expectations. I want to know who Cassie ends up with. I'm just a sapless romantic at heart! So I've only read the 5th wave, and it's been forever, but I hope that everyone ends up happy and alive at the end haha. No pain!! That's what I predict! I want to see how the series is going to end. I hope that Cassie saves the world. I don't know what will happen! I can't wait! I haven't read the second book yet but I will soon. My guess is Evan will die! I want to know if Cassie and Sam will both survive. I can't wait for The Last Star! I couldn't begin to say. Very exciting. What will happen with Cassie? Will she save them? Find happiness? I just hope nobody I like dies. But also, very excited! I'm dying to know what happened to Razor because that cliffhanger ruined the following month for me after I read The Infinite Sea. Also, I'm a little curious about all the alien bussiness too. I mean are they even real or did the Govern made them up? Fingers crossed no one dies. Spoiler alert: Razor died at the end of The Infinite Sea! :P At least I'm 99% sure, based on what the book said and something Rick Yancey posted on his Twitter page awhile ago. Mine is Evan and which side is he truly on at the end of it all. Will he get to live HEA with Cassie or will one of them pay the ultimate price for their freedom. I just bought the first book but haven't read it yet, so I have no idea what will happen! I want to know who Cassie ends up with! This is actually my 1st experience with this, so its all new and exciting. I just need to know how relationship statuses end up!